The Chrysalis Awards program, begun in 1994, recognizes the nation’s best work in 28 general categories of residential and commercial remodeling. Winners are selected for each of four geographical regions of the country. This year more than 80 companies from across the United States were named winners. The entries were judged on overall design, the creative use of space and materials, the degree to which the project enhanced the original structure, handling of challenges and cost benefit. The competition is open to any professional remodeler or design professional. There is no requirement to be a member of any specific trade association. According to Klepko, the staircase is often referred to as the centerpiece or “focal point” of the home because it is such a dominant architectural component and uses large vertical forms of space. Every staircase begins with extensive engineering and design knowledge. “Re-building a staircase is a unique blend of carpentry and artistry,” explains Klepko. During the whole house remodel, the owners elected to use their stairs as both a functional necessity and a statement piece – a lighter, gallery-like feel to the space. “The “U” shaped staircase involved three flights and two platforms where you turn 90 degrees at each platform,” continues Klepko. 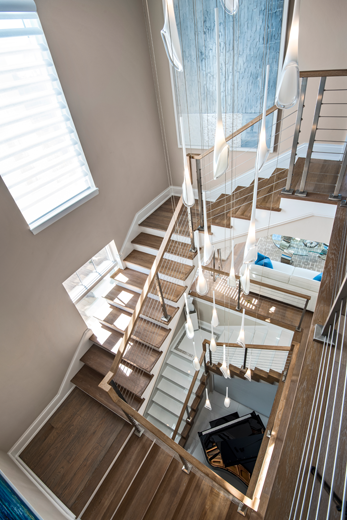 “The owners wanted to rehabilitate the stairs into a signature feature for their newly renovated home, seeking to upgrade all stair components including existing iron balusters, and installing a beautiful new handrail system,” he adds. The open staircase remodel focused on modernizing the existing strong structure, first-level porcelain treads and risers, first-level custom wood curb detail stainless posts, stainless cable, and wood handrail to match wood landings. The goal was to create a beautifully crafted staircase with strong form and function masterfully blended with timeless style and grace. Owners decided to refinish and replace traditional-looking staircase components such as the handrail, balusters and newel posts, treads, risers and skirt board. The final details gave the space some much-needed character and updated the home to a modern look and serves as a beautiful architectural element reflecting the home’s modern and open floor plan. Two key design challenges were working around existing wood flooring materials and locating a pleasing match to existing materials. In this project, the exposed staircase side required a new skirt board cut to fit and installed over the existing skirt, although the original treads and risers remained in place. The stairway was measured on site, hand-cut, stained and finished on the job site. 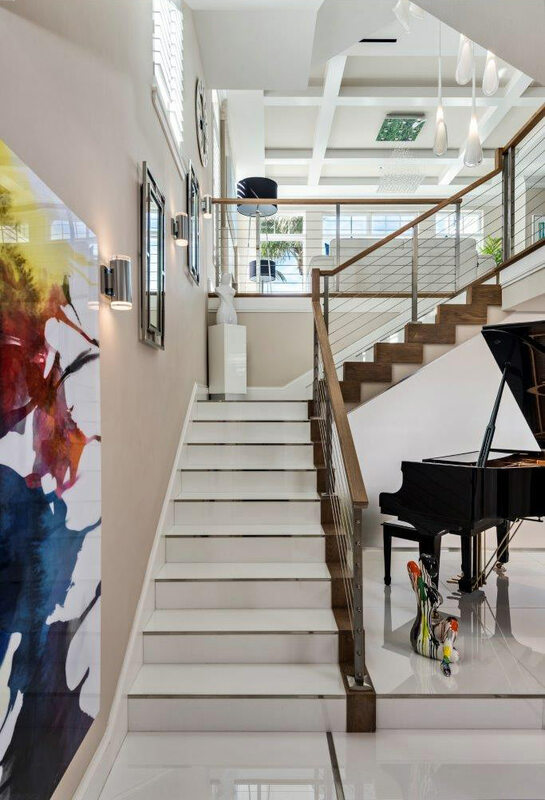 “A custom staircase must reflect the style of the home while being attractive and functional and can have a huge impact on the look and feel of a home,” says Klepko. The craftsmanship that went into this staircase redesign is more of a refined art, a mix of math and carpentry skills, he adds. 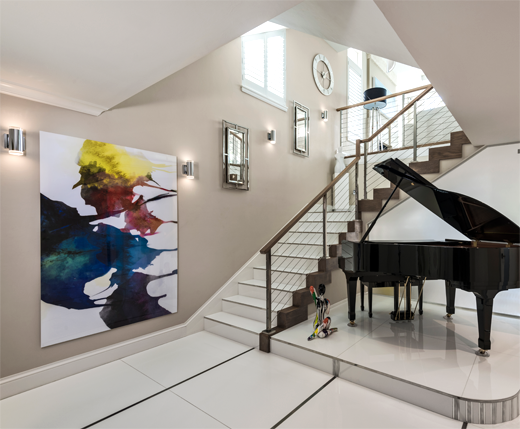 The homeowners enthusiastically embraced the new staircase as the perfect way to enhance the home’s new contemporary style. The transformed staircase is more in tune with rest of the home and acts as a great centerpiece. The new staircase and rail blends seamlessly into its surroundings, yet creates just enough visual interest to draw the eye without being distracting. Pictures of all 2018 award-winning projects can be seen on the Chrysalis website.